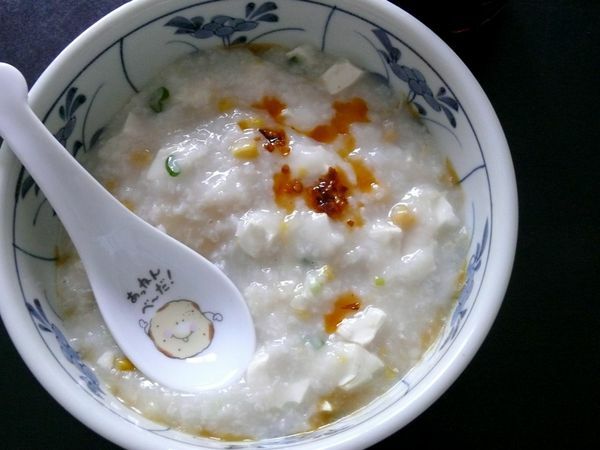 i had a hot bowl of congee, with sweet corn kernels and soft silken tofu, and the requisite hot chili oil of course. which needed to be eaten with a chinese soup spoon, and i happened to have this very cheery one on hand. i bought it, for you know, kids that might come over. to eat congee. that i might make. i’m not sure what that cute little spud is saying but it’s probably something like have a happy weekend, everyone. Cutest Chinese soup spoon ever. why did i only buy ONE? ?